Today I went to Joplin. First number one: I had never been to Joplin, MO before. I have a good friend here in KC who is from there, and her family still lives there, but I hadn’t made the trip yet. Sort of wish it had been under better circumstances, but it is what it is. Last Sunday, May 22nd, Joplin was hit by an EF-5 tornado. I had to force myself not to go down to help sooner, but respected the wishes of the city that called for only first responders and trained medical volunteers for the first 5-6 days after the storm. Finally, on Friday the email came down to all who had registered online to volunteer that they were now welcome. I signed up for a shift for Monday afternoon and proceeded to acquire work gloves, release forms, and other volunteer necessities. 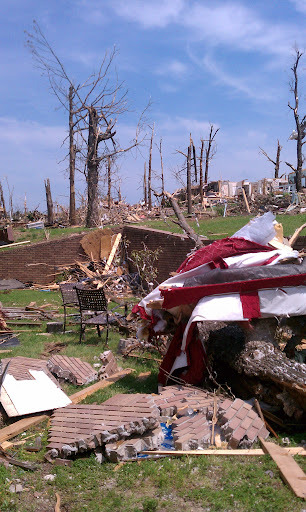 That red object is a couch wrapped around a tree – and two patio chairs immediately behind it, arranged exactly as they were before the storm hit. Driving through Joplin today was interesting – traffic moved slowly, as though everyone was just stunned to be driving through and seeing the damage on all sides. I didn’t take nearly as many pictures as I could have – I wanted to capture everything, but I was there to help, not to gawk, so I tried to keep my photo-taking to a minimum. This car had part of the house in it – a pile of bricks in the front passenger seat, and if you look closely, a brick wedged in the steering wheel. There was evidence that the residents still have a sense of humor, though. 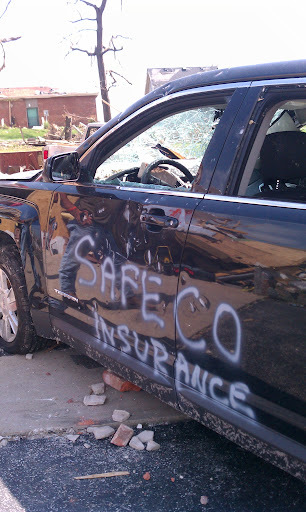 In front of one destroyed business, a sign that said “Closed for Remodeling.” Spray painted on the front of a house – “For sale cheap – open floorplan, natural lighting.” It was refreshing to be able to smile, and to know that people were still joking, amidst a landscape of such devastation. First number three: Someone in my busload of volunteers asked me why I had come down to help, and I had to explain it for the first time. When the storm hit on Sunday, I felt this eerie sense of deja vu from Greensburg, KS 4 years ago this month. I was working at the television station at the time and watched the tornado move through Greensburg on radar in 2007 just as I watched the tornado move through Joplin last Sunday, this time from home. Having visited Greensburg two years later and seeing how much work was still to be done, I felt an incredibly strong pull to go help in Joplin as much as I could. Other than my friend that lives in KC, I have no ties to Joplin. However, as someone who chases storms and did a stint as a meteorologist, I couldn’t ignore the videos, stories and photographs. Working there for several hours today, it was incredibly rewarding to feel as though I had helped, but equally as frustrating to see how it barely scratched the surface. I’m still not sure I’m able to put my reasons for wanting to help into words, but that’s about as close as I can get. First number four: I helped reunite a older couple with their cat. Granted, this had something to do with being at the right place at the right time, but my group of volunteers helped a woman find her cat in the basement of their demolished house. The woman hadn’t seen her cat since the storm came through over a week ago, and seeing her hold the cat in her arms for the first time was more touching than I would have expected. We were only able to find one of her two cats that were missing, but the fact that the cat was alive was incredible and gave me hope that others will still be reunited with their animals despite the length of time that has passed since the storm. First number five: This one seems trivial compared to the others, but this is the first time I’ve solely used the camera on my cell phone to take photos of an event. I brought a point and shoot with me, but it stayed in my bag. It was also remarkably easy to upload the photos from my phone to picasa, which I was pleasantly surprised about. The entire gallery can be found here. There are huge pieces of today that I’m leaving out for brevity’s sake, but the work being done by the volunteer coordinators in Joplin is thankless and impressive. Americorps, United Way, American Red Cross, the city of Joplin – they’re all doing an amazing job doing important work and keeping people informed on the progress. To be able to drive down every street to reach houses a few days after a storm of that magnitude is impressive by itself, let alone the speed at which infrastructure is being replaced to make cleanup safer. So, thank you to those groups for making it possible for someone like me to come help out for a day. I will most definitely be back.